What makes a good meal or food to survive in an emergency situation or crisis? What makes a good meal in an emergency situation? Being caught in an emergency situation can be a tough, tiring and frightening experience. There are things you need to do to get through them, from staying warm to keeping energized. The foods you prepare and eat in such circumstances are crucial to helping you achieve this. To help make sure you eat the right food, we look at what makes a good meal in an emergency situation. Many emergency situations can result in you getting cold very quickly, such as if you’re trapped in a building or are cut off from power and heating for a long period of time. So, it’s important to keep yourself warm. Foods that contain fats and slow-burning carbs, like noodles, can help with this. They release energy slowly, helping to keep you warm. When you might not have easy access to additional food, meals should also leave you feeling full, especially when you don’t know how long an emergency situation will last. Keeping hydrated is important for the same reasons, so you should make sure you have a good supply of water to help carry you through the emergency. 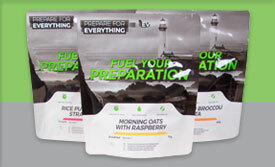 Food that gives you energy is essential to keep you strong, alert and focussed throughout an emergency. You might need to suddenly be evacuated out of a building or have to stay awake in case the emergency services try to make contact or find you. This includes foods high in carbohydrates, as well as snacks like energy bars, granola and peanut butter. Emergency situations can result in you being trapped and away from fresh air and having to stay in a dirty or dark environment and be vulnerable to disease and illnesses. So nutritious food is important to help keep you well and healthy. This includes fruit and vegetables, filled with minerals and vitamins. Good choices are canned products, which keep for longer. During an emergency situation you want as few extra concerns as possible. 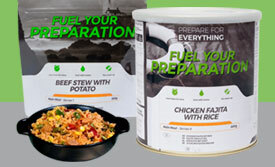 This is why a supply of long-lasting, easy to store and simple to prepare food is important. You want food that doesn’t require refrigeration and is stored in packaging that helps keep it free of dirt and bacteria. Cans, pouches and tinned foods are usually perfect for an emergency food supply as they tend to have lengthy usage dates on, meaning they can form a long-term food store. The meals should also be easy to prepare, so that they’re ready to eat in minutes and you don’t waste time and energy cooking. Examples of foods to consider include instant meals, like cups of noodles, ready-to-eat canned foods, like fruit and meat, and freeze-dried foods. When caught up in any emergency situation, it’s important to have the right food to not just help you survive it but get you through it in the best physical condition. With a wide range of fulfilling foods to choose from, our products will ensure you have got exactly what you need to get you through any emergency situation. 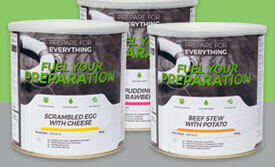 To find out more about our selection of freeze-dried foods, please take a look at our meals page or contact us to speak to a member of our team.